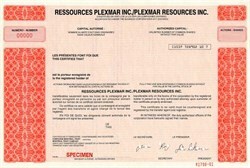 Beautifully engraved SPECIMEN certificate from Ressources Plexmar Inc. . This historic document was printed by the B A Bank Note Company and has an ornate block border on the left side. This item has the printed signatures of the Company's President and Secretary. QUEBEC CITY, QUEBEC--(Jul 6, 2004) - Plexmar Resources Inc. (TSX Venture: PLE), announces that it has recently completed its ground geophysics program on its' gold and silver Cascajal Project located in northern Peru. The geophysics program collected 49 kilometers of Induced Polarization (IP) data, 53.5 km of Total Magnetic Intensity data and 120 km of topographic data. The purpose of these surveys was to detect know mineralization, to define its' extent and strike direction, and to find new areas of potential mineralization. The IP has succeeded in detecting the known sulfide rich gold silver mineralization and interpretation suggest an additional strike length of at least 500 meters. Several other IP anomalous zones have been defined and are mostly located to the west of the known mineralization. The western part of the property is more difficult to access, and as such, has been less explored. A geological program of mapping, prospecting, and systematic soil and rock geochemistry is ongoing, and will be investigating the western anomalies. A total of 1,500 of soil and rock samples are being collected and the results will be released as soon as possible. Road construction for the coming diamond drill program will begin shortly. A 3,000 meters diamond drill program aimed at testing the known resource and the new geophysical targets should begin around mid July. The Cascajal project is located in the La Libertad Department, Northern Peru, in the Yanacocha-Pierina gold belt. The property hosts shear zones with quartz and sulphides containing as much as 37,5 g/t gold (1,21 ozs/ton) and 2,060 g/t silver (66,2 ozs/ton). Inferred resources stand at 863,000 Tons grading an average of 4,93 g/t Au and 246 g/t Ag (not calculated according to norm 43-101). Plexmar recently acquired a 150 Tons per day flotation mill located about 4 km from the property. It is Plexmar objectives to put the mill into working condition, expand its production capacity to 500 TPD and explore the great potential of the Cascajal property.